If you’ve already tucked away your boots and blue jeans from Stock Show season, pull ‘em back out for Off the Clock: Two Step ‘n Tulips, a festive celebration of bluegrass tunes, country dancing and Americana kitsch! Open to everyone (but geared toward adults), each Off the Clock event harnesses a different theme to curate music, hands-on activities, entertainment and games, and special menu items that allow our guests to see the Gardens in a whole new light. Two Step ‘n Tulips is a new theme this year, and we’re looking forward to quite a night! We are thrilled to welcome Grass It Up, a Colorado Springs-based band that makes many of their own instruments from found objects and will have your foot tapping the whole night. Don’t miss Vi the Fiddler, four-time Colorado State Fiddling Champion and four-time finalist of the Grand Masters’ Fiddler Championship. Dance the night away to country classics with the Halden Wofford Trio in the stunning surroundings of Marnie’s Pavilion. 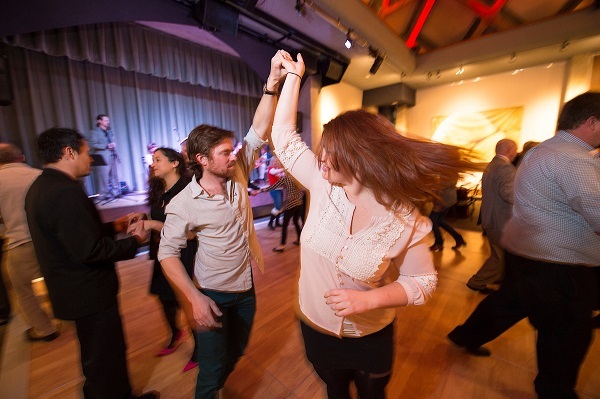 Adventures in Dance is back to teach some quintessential country line dances – take a lesson, then practice your skills to our live band afterward. Take home a kitschy keepsake: make your own mini bouquet with fresh flowers, or create a sunset silhouette to celebrate our gorgeous Colorado sunsets. Not feeling particularly crafty? Relax with a coloring sheet! Head over to the Orangery for a game or two of bingo. Snap a photo of you and your crew at our photo booth when you arrive. Compete for prizes by solving riddles and answering trivia. How much do you really know about bluegrass instruments? Find the answers to our scavenger hunt to have fun and learn some fun facts, too! Catch up with our docents in the Boettcher Memorial Tropical Conservatory to learn more about the exotic plants (and animals) that live in our indoor rainforest. Offshoots Café will be open offering its full menu and feature finger-lickin’ specials that are equally at home at a picnic or a cookout as they are in the Gardens. Stop by early, specials may sell out! So head on over for a night of good ol’ country fun! Tickets are limited, so purchase yours today online or at the Bonfils-Stanton Visitor Center. Ticket prices go up at the door.